Ya but that sale ends tomorrow. colipos2 wrote: Ya but that sale ends tomorrow. WTB the piece from the AT that is attached to the spring, I stepped on mine :(. I know this is a longshot (pardon the pun) but does any know where one can get the Nerf Disk Shot in Australia? The clay shoot type thing? I know there are a couple on the US ebay, but I think postage would kill. I'm after the system and launcher. Well, it's not called the Disk Shot here - I doubt anyone has seen that set on sale in Aus. 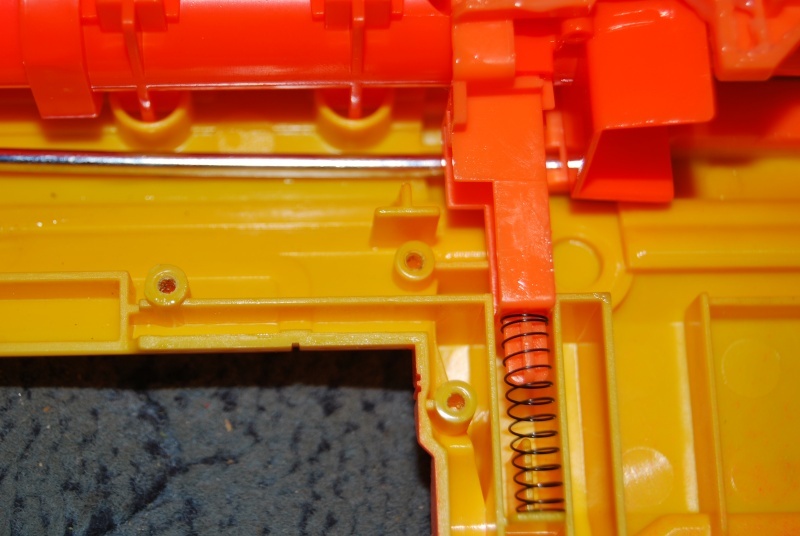 But it does look strikingly the same as the Nerf Element - you might want to search for that instead. The Disc Shot was sold in Toys 'r' Us back before 2009. The model itself has been discontinued from Hasbro catalogs around 2006-2007 and therefore I'd advise that you're better off finding one from the US. blue raider stock for a yellow one. WTB AT on its own. Don't even need plunger tube or spring or catch. WTB Longstrike stronger spring, Melbourne preferred. ZeusPwns wrote: WTB Longstrike stronger spring, Melbourne preferred. Thanks for that Luke, Much appreciated. Anyone here in Melbourne, preferably close to Dandenong that can Brass Breech my longshot? Also, anyone interested in a practically new stock Longstrike? I will send you a pm soon. Thanks for that mate, but still need a singling kit or parts. Anyone know where i can get any? But, if you want I can sell you a SS Spring from Silent Scope himself. Since I live closer. Ohh thanks for that, will keep in mind! ZeusPwns wrote: Thanks for that mate, but still need a singling kit or parts. Anyone know where i can get any? There's no singling kit. It's so easy you don't need one. Really it's just e-tape, 20mm conduit and a 15mm PVC T-coupler, at least that's what I used in my singled LS (after I had sold off some bits and used others as replacement parts for my other LS). I used 17/32" brass and a copper t coupler which i sanded down to fit. I also used a peice of 20mm upvc conduit for the bolt which was trimed to fit into the coupler. Instead of using all that, cant you just use Conduit and PVC? Its whatever tight you want the dart to be and what is available to you. Its your descision. WTB: Nitefinder battery compartment lid cover thingy. PM me. melbnerf619 wrote: WTB the piece from the AT that is attached to the spring, I stepped on mine :(. Pm me your address and I'll send you one I have here. For free too by the way. WTB Shotblast tank or Titan tank. Postage to 6025. Send me a PM. Wanting a singled longshot, preferably no intergrations, but with is fine, or brass breeched LS with BS reinforcement. Willing to pay 70 for the singled and 80 for the brassed one. Let me tell you that price is way to low. Just for the LS itself and buying the brass would be $70. Cmon guys, need this ASAP, by tomorrow!!!!!!!! Also, wouldn't mind a stock longshot! Willing to pay $30 for one in Victoria! Can pickup tomorrow! Seriously $30 for a longshot? At very short notice. You've got to be kidding.